Editor's note: Windsor aircraft enthusiasts ventured to Canada's Arctic to salvage what remained of a warplane that went down during the Cold War. Reports by Star reporter Doug Schmidt continue Monday. Laboring under that same midnight sun and moiling for something considered by historical aircraft buffs to be as valuable as gold, a group of Windsorites has added to the cache of Arctic lore after a week of adventure in the barrenlands of Canada's Northwest Territories. The remains of a Second World War bomber that crash-landed during the Cold War are now on their way to Windsor. Mission accomplished. The group of Far North adventurers, members of the Mosquito Bomber Group wing of the local Canadian Historical Aircraft Association, returned this week after coping with a constant fog of mosquitoes, powerful winds whipping heavy rain and gritty dust, and temperatures that could swing at whim from sweating hot to shivering cold. The mood swings displayed by the explorers during their Nunavut sojourn were sometimes as extreme as the elements of the Arctic, where, on a clear day, you can see the edge of the world curve off the faraway horizon. It's an area so huge that the group's Pelly Lake camp just below the Arctic Circle was actually closer to Canada's geographic centre than Windsor is to Toronto. Waking up one morning during a two-day battering of 60 km/h winds and rain to find his sleeping bag and all his belongings in a growing lake, wet and shivering group leader Tim Gillies found one of those low points. "I've never felt so hopeless in all my life as I did at 5 a.m. this morning," said Gillies later on Day 6. The president of the Mosquito group, Gillies was the man who launched the salvage operation. As he spoke these words, a ground fog was moving in, threatening the group's charter aircraft pickup and making life appear bleaker. But, as with the Arctic weather, the deepest lows on the trip were tempered by ecstatic highs, and the hindsight of Monday's warm, dry and safe return led all to say it was an excellent and successful adventure. Taking advantage to 24-hour daylight, modern technologies such as satellite telephones combined with old-fashioned sweat and toil, two prized Rolls Royce Merlin engines are a step closer to adorning a rebuilt Mosquito aircraft to be housed at Windsor Airport. Also found: The bomber's escape hatch, landing gear, propellers and cockpit canopy. To the untrained eye, much of what was dug out of the tundra sand and loaded on to several Twin Otter charter flights for the first leg of the long journey south looked like ugly aluminium junk. But to individuals like Gillies and his cohorts, even a twisted piece of metal engine covering was a source of unbridled joy. "Our sheet metal guys can look at this, build an original," said Gillies, handling the jagged piece like a gem-encrusted treasure pulled out of King Tut's tomb. 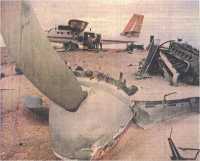 The constant winds sandblasting the aircraft leftovers and the prevailing desert-like conditions of the barrenlands have preserved what remained of the fiery crash-landing, July10, 1956. Windsor's John Braidford, who flew in a Mosquito during the war, said he can't wait to see the finished aircraft. It is something that the Mosquito Bomber group estimates could take another eight years and up to $1 million to accomplish. Despite the tonnes of metal hauled out, this is just the start of a lengthy collection process that will likely be carried out on a global basis. Although close to 8,000 Mosquitos were built (1,130 in southern Ontario for the war effort), manufacturer de Havilland estimates only 28 specimens of the famed war bird are still around, most of them as static displays in museums. "It was the best aircraft in the world," said Braidford, who was a navigator stationed in England from 1941 to 1943. His night fighter squadron's task was to scramble after any intruding enemy aircraft. "It was so fast, made of plywood with two of the best engines - nobody could run away from you," he said, adding his Mosquito's targets were "anything that came over." Also curious about the local group's progress is the pilot who was forced to ditch the Mosquito in the Far North exactly 40 years ago. Al MacNutt, who was on aerial photography mapping mission at the time, continued flying for a living until a few years ago. He now sells real estate in Abbotsford, B.C. "I don't know how much there is or whether it's worth fixing. There wasn't much left when I last landed it," he said in an interview before the Windsor group's departure north. MacNutt is writing a book about his years as a pilot, beginning with his war-time training and including two decades fighting forest fires. At the end of the salvage mission, Gillies said he was happy with what was found. He called the mission a success. For him and the others, all passionately steeped in the mythology of their subject, the adventure itself was reward enough. "Those 18-hour days just do something to me," said fellow crew member Randy Cyr, referring to the long days of digging, hauling and lifting. "This is my kind of vacation," said Cyr, one of two materials handling experts on the trip. He said the highlight for him was seeing the two Mosquito engines, each weighing almost a tonne, safely on the plane out.